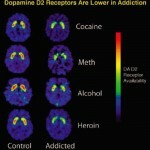 the drug overstimulates the brain’s “reward centers”. Heroin, cannabis and some other drugs contain chemical compounds almost identical to so-called neurotransmitters, naturally produced mediators of information. Thus, the drugs are able to affect the associated receptors and cause abnormal reaction of neurons. On the other hand, cocaine or MDMA stimulate the cells to release extraordinarily big amounts of such neurotransmitters as dopamine. As a result, the brain is unable to recycle these transmitters and shut down communication between brain cells. As the brain floats in excessive dopamine, pleasure centers of the brain get overstimulated: the “reward circuit”, which is normally launched by behavioral patterns, essential to survival and reproduction, provides the feeling of euphoria in response to drugs. Such repetitive stimulation instills a clear connection between taking drugs and reward as the body starts to “think” that psychedelic substances are essential to survival. What is more, the brain – an amazingly adaptive system – gradually gets used to excessive levels of dopamine and decreases its own production of this neurotransmitter or reduces the number of associated receptors. It is due to this process, that the addicted person loses the ability to find pleasure in anything, rather then drug use. As the brain adapts to higher concentrations of dopamine, the user needs to increase the dose of the substance even more to overcome the brain’s tolerance and achieve former (or, sometimes even normal) levels of pleasure. Another important neurotransmitter is glutamate. It regulates the ability to learn and also takes part in the work of the award system. Long-term substance abuse affects the levels of glutamate production as well and the addicted person becomes less intelligent. Moreover, research show serious changes of brain areas, responsible for decision making, critical judgment, cognitive abilities, learning, behavioral patterns and memory in long-term drug users.. Thus, the patient is unable to stop taking drugs despite obvious harm they bring and this is the key feature of addiction.